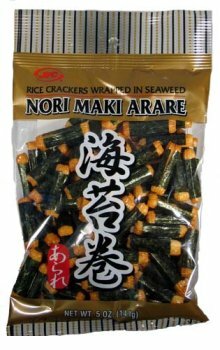 Norimaki arare: it's a piece of seaweed wrapped around a sweet rice cracker. I would never have thought seaweed crackers would be addictively good, or something I couldn't stop eating. But they are. The other day I had a seaweed craving. Could not stop thinking about how much I wanted to eat seaweed. So badly that, having only a short period of free time, I dropped by the Asian Market just to pick up a bag of these, despite the fact that I haven't been to the regular grocery store in a couple of weeks and have been eating leftover dinner for breakfast. Mmm, seaweed rice crackers! Food can be a great source of subtle humor in a book. Whether a character has an odd craving, or an addiction to french fries dipped in tomato soup, or frequently refers to fish fingers and custard, it's a great way to lace in a character quirk. It can also tell you something about the character. How does your character take her coffee? Does she gulp it down so fast it scalds her tongue? She's showing her impatient, impulsive side. Does she set it aside and wait until it's cool? Patience, planning. Maybe she adds lots of sugar--a sweet tooth, meaning she likes a little luxury. Or if she pours in cold milk with no sugar, she's showing herself to be a thinker--impatient and unwilling to wait for the drink to cool down, but smart enough to avoid burning herself. Perhaps, instead, she's the one tea-drinker in a group of coffee-lovers: she could be an outsider, or an independent thinker. Maybe you have a group of characters. How they eat together will evolve as their relationship does. At first, dishes are probably passed with polite requests, but as they get to know one another well, a wave of the hand or a "Hey, pass that over here" takes the place of formal manners. Slightly awkward polite small talk makes way for jeers and friendly banter. Or, for a couple, perhaps flirting evolves into plate-sharing, casual touches of the hands and arms, and warm smiles. Try finding a scene in your WIP (or write one as a side piece if there isn't one) in which your protagonists have food at hand. What are their food choices showing about their personalities? How are they eating, and how are they interacting with one another? Without increasing your word count by more than 10 words (try to cut it shorter, if you can! ), try layering in a little food-symbolism, humor, or character development.